Seventy years ago on Saturday, the former Soviet Union found out that Germany had surrendered World War II — known there as the Great Patriotic War. Because the surrender was signed after midnight Moscow time, celebrations in ex-Soviet states still occur on May 9, a day after Victory in Europe Day. 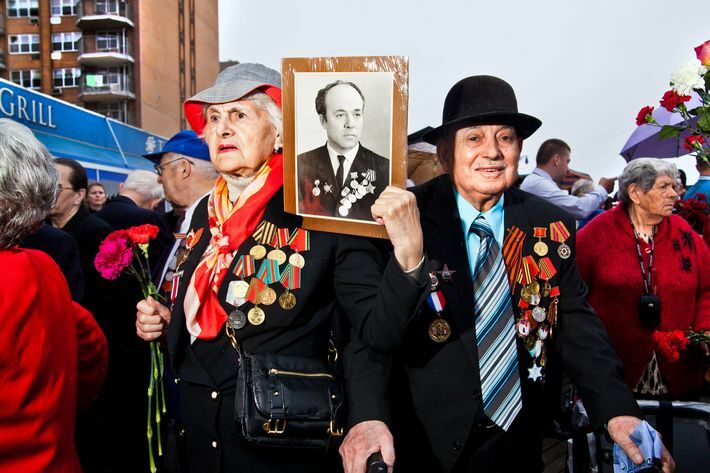 More than 20 million Soviet citizens, civilians and military, died during the war. Estimates say that more than 8 million of them were killed while fighting. The day is a remembrance of family and of a type of Soviet glory that was never really recaptured. 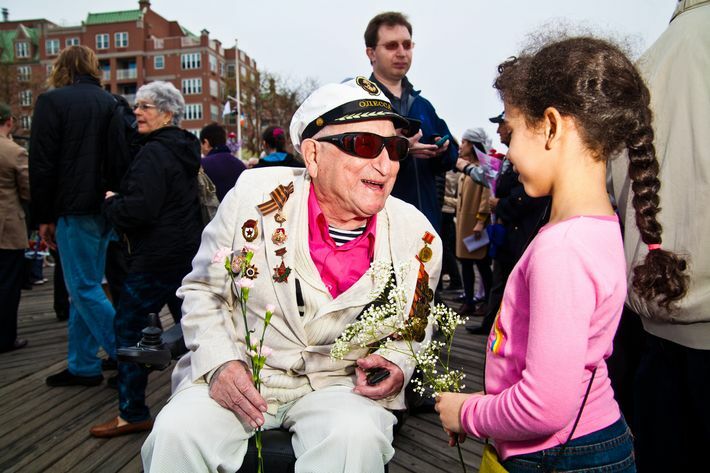 In Brooklyn’s own corner of the former Soviet Union, Brighton Beach, community organizations hold an annual parade to celebrate the survivors and remember those who perished. 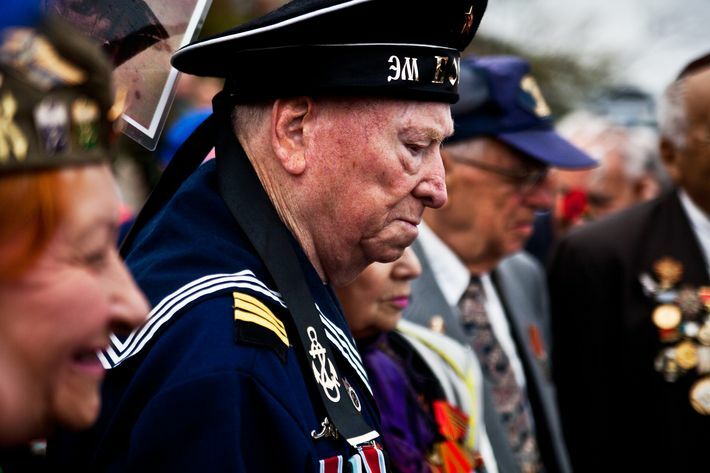 Each year, the number of veterans dwindles. According to tradition, onlookers bring flowers to give to men and women who served. Many also bring out enlarged, laminated photographs of family members who fought. 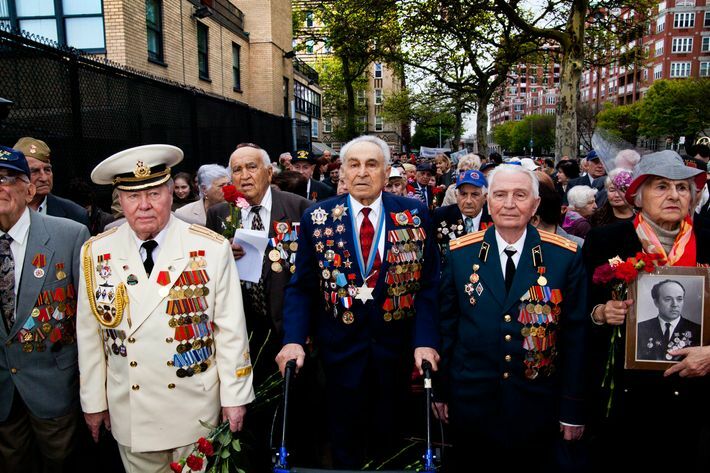 Veterans — and their progeny — wear medals they were awarded: Those from the war effort are distinctive, often featuring red flags or images of Stalin, while others are from periodic commemorative celebrations. They are mobbed by onlookers who want to take photographs with living history. 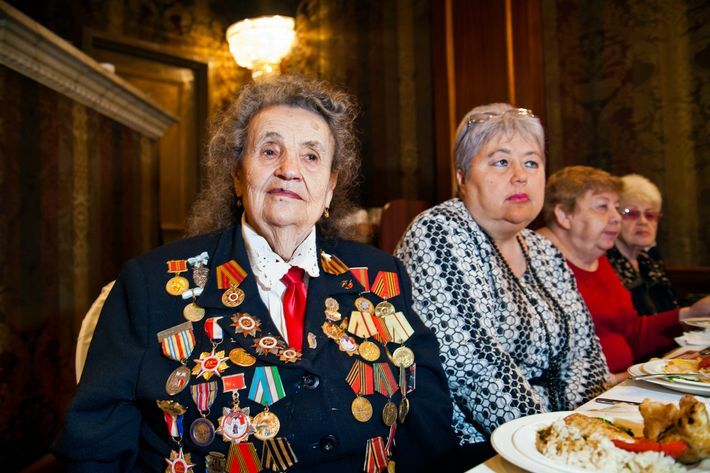 Ninety-year-old Asya Gindina, pictured above at an invitation-only lunch sponsored by the Council of Jewish Emigre Community Organizations after the parade, has medals for wartime bravery and for bearing nine children in the postwar years. “When the war started, the Nazis took my city without a battle,” she recalls. Her parents were shot, seven siblings died, and she fled to Korosten, where she joined the war effort at 16 and became a nurse. “We liberated Stalingrad, and there I saved my future husband’s life by pulling him from a burning tank,” Gindina says. “He told me, ‘If I survive, I will find you.’” They reunited after the war, after two years of searching. In her Starrett City building, she met two other veterans — both men she also rescued on the battlefield. “Look at how many clients I have,” jokes Iosef Kuglack (above), a former Soviet sailor who’s a very popular target for people looking to get a photograph with one of the veterans. The 89-year-old served in the Black Sea Fleet during the war, which onlookers say was known by Germans as the “Black Death.” “The most important thing is that we remained to live after the war, that’s the most important thing,” Kuglack says. He found out about the war’s end through the radio, but his service wasn’t over — Kuglack remained with the Black Sea Fleet, serving out a total of seven years instead of the regular five. “The war years didn’t count towards my service years,” he explained. “We killed fascists,” Miron Goldsheyt says simply. Originally from Odessa, he says he served “everywhere for a little bit” during the war. “It was very scary, and those who survived are heroes. They remember this day,” he says. 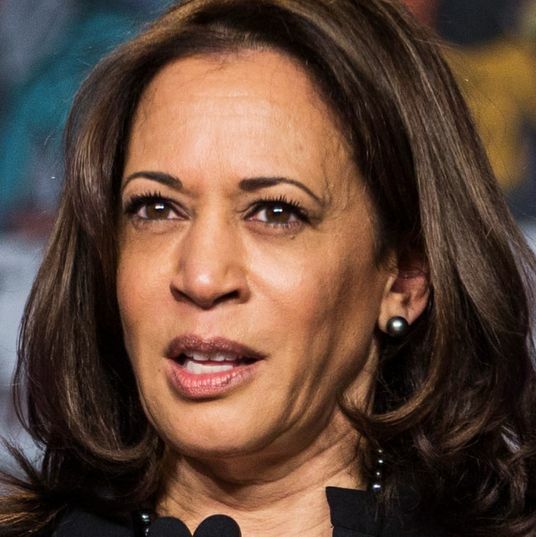 “No one will be able to steal our victory from us,” he adds, referring to the Soviet army.